Intel's investment arm, Intel Capital, plans to spend more than $250 million of additional new capital over the next two years to drive the development of autonomous driving technology. During a keynote speech at the LA Auto Show's AutoMobility conference this week, Intel CEO Brian Krzanich emphasized how critical the automotive market has become to the company. 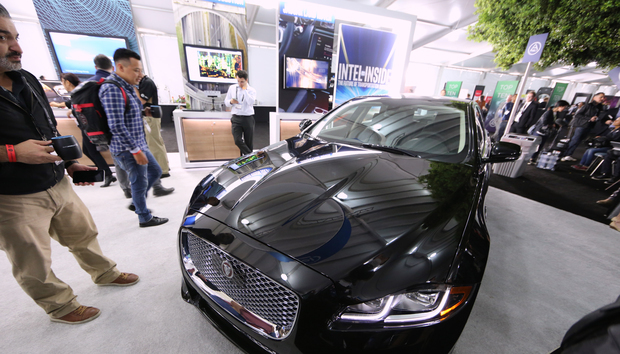 Intel Corporation displays its automated driving technology at the Automobility LA conference on Tuesday. "These investments will drive the development of technologies that push the boundaries on next-generation connectivity, communication, context awareness, deep learning, security, safety and more," Intel said in a news release. The automotive industry is on the cusp of a major transformation, Krzanich said, and that will require an "unprecedented" level of "computing, intelligence and connectivity." Intel's role in autonomous driving technology involves the processors in a variety of sensors, sonar, LiDAR and cameras that will come embedded in autonomous cars, as well as the computers within vehicles that process data from those sensors. That data is also sent back to automakers to help improve the vehicle and self-driving technology. Krzanich said there's a need for the auto industry to be prepared for that data deluge with over 4TB of data being generated from a single car each day. One early study showed autonomous vehicles could product up to 1GB per second of operation. Intel has partnered with self-driving technology makers, such as vehicle camera company Mobileye, and carmakers such as BMW, to produce fully-autonomous vehicles by 2021. Intel said it will also invest in technologies that will drive global Internet of Things (IoT) innovation in transportation; "areas where technology can directly mitigate risks while improving safety, mobility, and efficiency at a reduced cost; and companies that harness the value of the data to improve reliability of automated driving systems."